Tired of the winter? 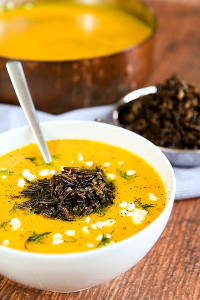 In this case, it’s time for a dinner that will warm your soul and your palate! 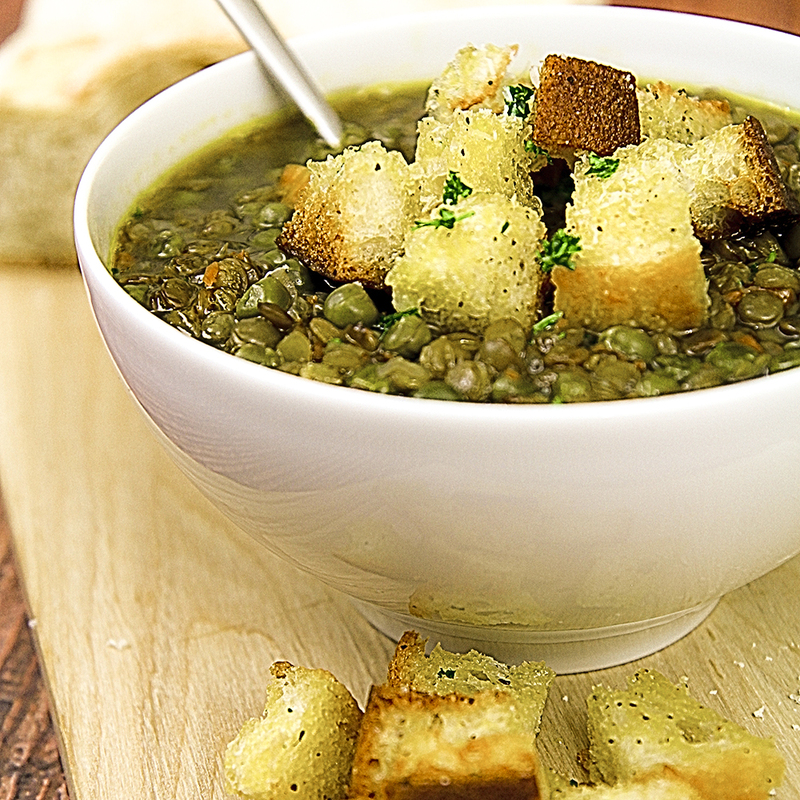 The lentil and green pea soup is a classic of the peasant cuisine. I really like to prepare it during the last days of winter: its warmth comforts me and green peas remind me that the spring is coming! In this case, I served the soup with crispy croutons, but if you prefer add rice, pearl barley, or spelt, cooked in the vegetable broth along with the vegetables. First, wash the lentils in cold water and let’s put it to soak for 10 minutes (this not mandatory, but makes it easy to cooking and increases the digestibility). Meanwhile, finely mince the carrots, cut into very thin slices the shallots and crush the clove of garlic. In a pot, stir fry the carrots, the clove of garlic and the shallots with 3 tbsp of olive oil. 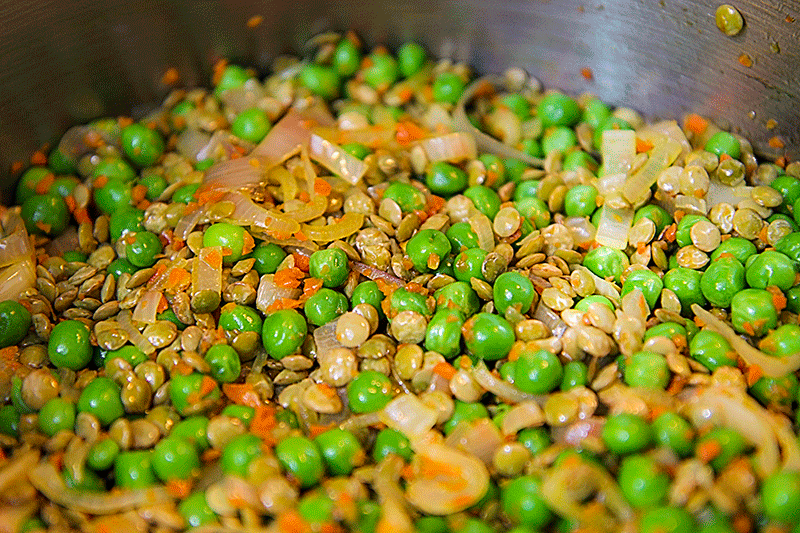 When the garlic is soft and translucent, add the lentils and the green peas. Heat for 5 minutes, stirring with a wooden spoon, then add the vegetable broth boiling. Cover the pot leaving a small opening and set the flame to simmer gently the soup. Continue cooking for 40 minutes. 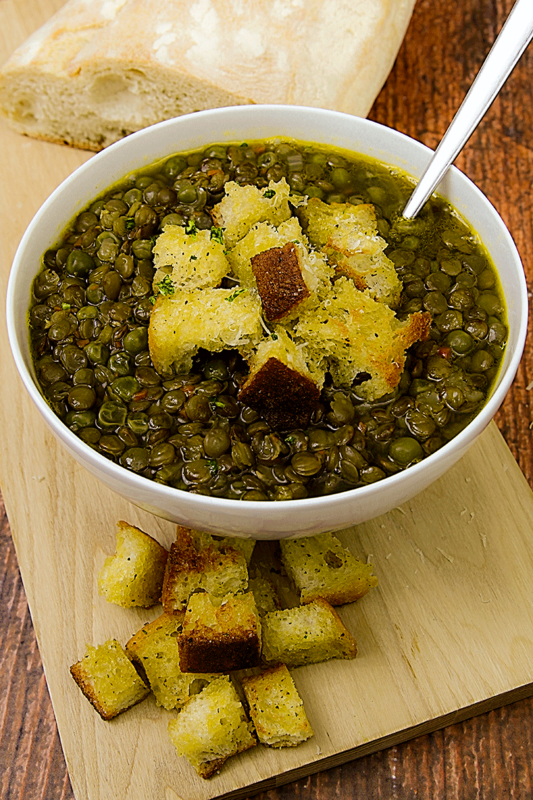 While the soup is cooking, cut the bread into cubes seasoning them with a drizzle of olive oil and a pinch of salt. Grill the bread on a baking tray lined with parchment paper. Roast the croutons until the bread is golden and crispy. When the soup is ready, add salt to taste and pour it into the cups. Decorate each portion with ground black pepper, Parmigiano Reggiano cheese, minced parsley and a drizzle of olive oil. Serve the soup hot with the croutons. Tired of the winter? In this case, it's time for a dinner that will warm your soul and your palate. 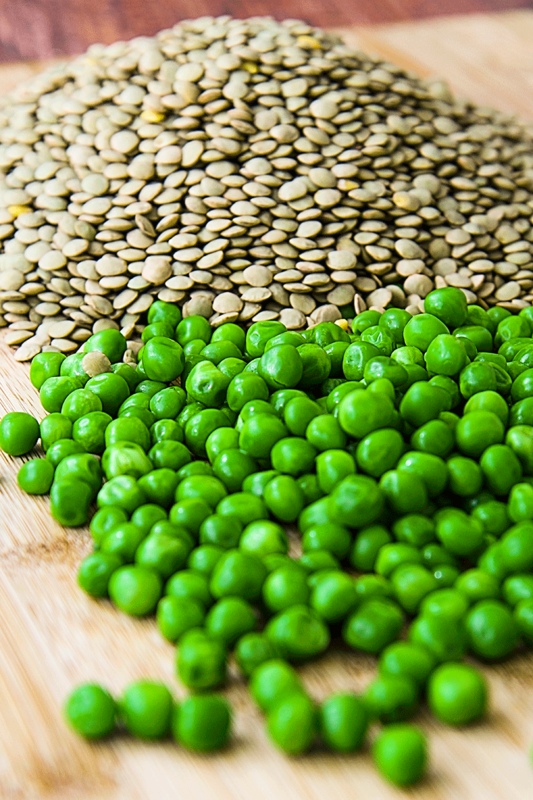 The lentil and green pea soup is a classic of the peasant cuisine. I really like to prepare it during the last days of winter: its warmth comforts me and green peas remind me that the spring is coming! In this case, I served the soup with crispy croutons, but if you prefer add rice, pearl barley, or spelt, cooked in the vegetable broth along with the vegetables. First, wash the lentils in cold water and let's put it to soak for 10 minutes (this not mandatory, but makes it easy to cooking and increases the digestibility). 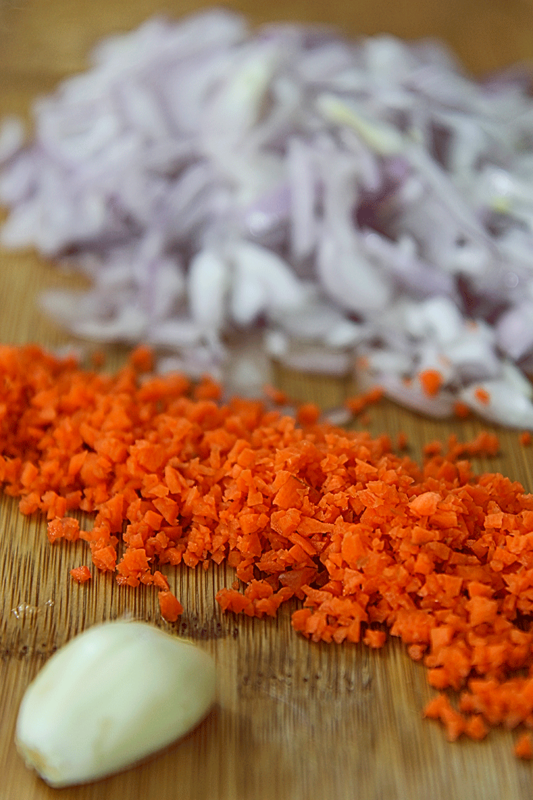 Meanwhile, finely mince the carrots, cut into very thin slices the shallots and crush the clove of garlic. Ciabatta bread croutonsWhile the soup is cooking, cut the bread into cubes seasoning them with a drizzle of olive oil and a pinch of salt. Grill the bread on a baking tray lined with parchment paper. 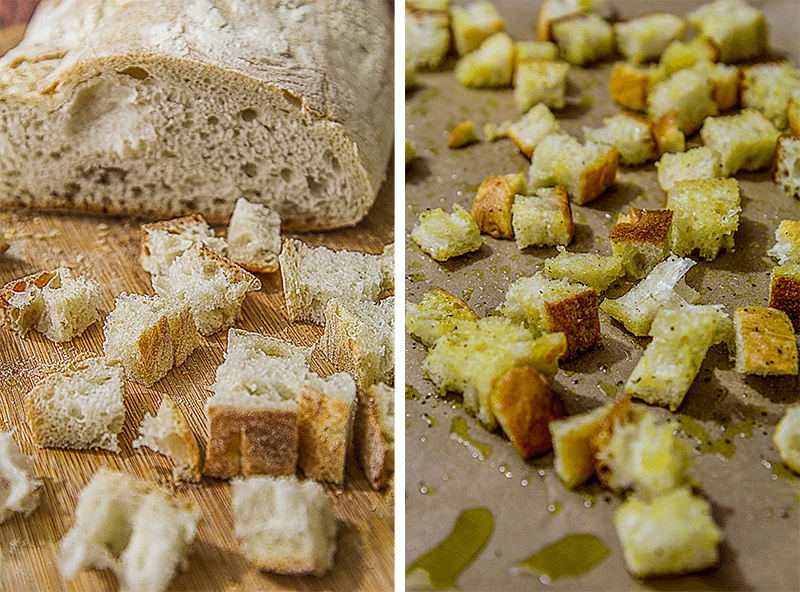 Roast the croutons until the bread is golden and crispy.